"What I really wanted to do was make a movie that seemed on one hand to say, 'Let's just go and kill a bunch of bugs, man, it's gonna be great!! ', but on the other hand, at the very end of it, I wanted to say, 'Look at yourself in the mirror and look at what you become when you do this.'" Other Stars: Neil Patrick Harris, Michael Ironside, Jake Busey, Patrick Muldoon. I remember when I initially heard that Robert Heinlein's 1959 novel, Starship Troopers, was to be made as a film I was very skeptical. It was not so much because I thought the book was any great feat of literature, though it is a reasonably entertaining read, but it was more because I felt the dated, pulp-fiction aspect of the novel would probably get lost somewhere in the transition. To me, many of these old sci-fi stories from 1950s and '60s were mildly amusing in the way the authors often transposed their own personal political beliefs into a story set within a fantasy context, and much of this pulp-fiction was the outline for a possible future, as told by people like Heinlein, Ray Bradbury, Poul Anderson, Brian Aldiss, etc. Starship Troopers was a glowing portrayal of a future Earth in which a military regime rules through a semi-fascist state in which only people who participate in vague, on-going wars against extra-terrestrials are given citizenship rights; a philosophy Heinlein felt was the answer for democracy's problems. Lucky for the police state, mankind is embroiled in a war against giant insects from a planet called Klendathu, which keeps the blood boiling in patriotic Earthlings long enough to convince them to sign-up, see the stars, and splatter some insects. The movie keeps the core plot of the novel, that of a group of teenagers from Buenos Aires who sign up for military service in order to become full citizens, then wind up fighting a war against the Klendathu aliens. The gun-toting kiddies include Johnny Rico (Casper Van Diem), Carmen Ibanez (Denise Richards), Dizzy Flores (Dina Meyer), and Carl Jenkins (Neil Patrick Harris). 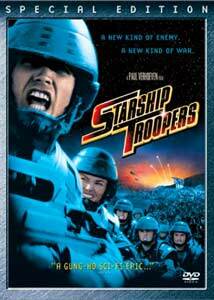 When the time actually came to sit in a theater, let the lights dim, and watch Starship Troopers to fill the screen, I was amazed at what I was seeing, and I felt very guilty for having ever doubted director Paul Verhoeven could take this concept and make a movie that worked. From the opening sequence (a wonderful, propaganda segment from the future's global news network, FedNet) onward, I was amazed at the balance between creating a very simple, entertaining sci-fi story, that was also multi-layered and purposefully silly, able to poke fun at the blindly patriotic war movies of the past, yet honors them by creating something on the same scale. In a potentially fatal move, the script seemed to take the pulp elements of the novel and make them a literal part of the film. While this dark, social humor was easily apparent in Verhoeven's classic masterpiece Robocop, it had to be laid on much thicker here to make things work and that was a dangerous idea. For me, Starship Troopers is mostly a success; a film that proudly showcases its insipid portrayal of empty-headed "perfect" teenagers who wholeheartedly believe in their deeply militarized society. It's Beverly Hills 90210 with guns, grenades, and giant insects. It manages to be exciting and entertaining, but also has a distinct tongue-in-cheek subtext. The kids are sliced and diced by enemy bugs in relentlessly gory sequences, yet they keep moving on, and with a fairly chipper attitude to boot. Of course, due to this aspect, it's hard to judge what parts are horrible acting and writing, and what parts are supposed to be that way. The problem with Troopers is, ultimately, that by keeping the tone of the film teetering between satire and wanting to tell a seriously entertaining story, I think audience members aren't sure what parts are which. When you make almost an entire film into a big, inside joke, you risk alienating a lot of people, and Troopers does come off as either too much or too little. Many people actually thought the film was intended as a celebration of fascism and xenophobia, and I think that's a direct result of the miscommunication between the idea and the execution. Make no mistake, though: beyond the subtle political elements, Troopers is a special-effects laden action movie that delivers well on the promise of a war with bugs, though it leaves a very wide door open for a possible sequel. In the end, I think that anyone watching this film needs to have a sense of humor and not take the story too seriously. I think there can be no argument, in retrospect, that Starship Troopers was meant to be rather simplistic, explosive yet relatively lighthearted. In many ways it's an inherently silly movie, but it gets the job done and shows an amazing amount of technical prowess, especially in terms of Phil Tippet's effects work which, in my opinion, easily stands as some of the best, most realistic, computer effects yet seen in cinema. Like many of Paul Verhoeven's works, I simply cannot picture this film in anyone else's hands. Image Transfer Review: Unless it's my imagination, the transfer here seems markedly better than the one on the original Troopers DVD. While there is some evidence of grain and minor speckles on the print (especially in the earlier sequences), the film is very crisp and clear, which works well given the rather "plastic" and perfect look of most of the sets. There is a bit of aliasing from the anamorphic enhancement, but it isn't too bad, and there doesn't seem to be any problems with edge enhancement that I noticed. Obviously, on lower quality displays, there will be a little bit of 'rainbowing' on sharp edges, but it didn't seem greatly exaggerated as it might be if it were a transfer issue. Some of the more difficult scenes, mainly those set on the harsh deserts of Klendathu's moons, don't show any of the problems typically associated with bright, sandy cinematography. This is a very solid image, and it only enforces the superb and complex CG work featured in the movie. Audio Transfer Review: The Dolby 5.1 soundtrack is, as one might expect, filled with activity, booming bass, and lots of action. The track is balanced well between all the speakers, and directional effects and split-surround events are mixed so as not to draw attention to themselves. There's a great deal of ambience in even some of the calmer scenes as well. The action scenes are totally explosive and fit the film very well, offering quite a theatrical experience in the home environment. The soundtrack score, by Basil Poledouris, is very well represented, definitely bringing attention to itself in a very proper and fitting way. 3 Feature/Episode commentaries by (1)Director Paul Verhoeven and writer Ed Neumeier, (2) Paul Verhoeven, actors Casper Van Diem, Neil Patrick Harris, Dina Meyer, (3)Composer Basil Poledouris with isolated score. Original Test Film "Don't Look Now"
Extras Review: While some of the extras in this new edition are carry-overs from the original "Special Edition", many of them are newer and add more to the overall quality of the package. The feature film itself has 3 commentary tracks. The first is by director Paul Verhoeven and writer Ed Neumeier. If you had any doubts about what Starship Troopers was meant to be saying, if subtly, these guys certainly make that message clear, which may or may not be received well by some. They spend a good portion of the movie talking more about politics and how the film pokes at the American political scene, especially in terms of attitudes towards war. They also discuss their motivations for their portrayals of the characters, which was written off by most as bad acting and writing, but was actually intentional to provide a very clear image of the characters as being rather dumb and innocent. It's a good commentary, but not terribly technical, and it's always nice to hear Verhoeven where he's accompanied by someone, since it breaks up his manic discussions into more digestible chunks. The second commentary features actors Casper Van Diem, Neil Patrick Harris and Dina Meyer, accompanied by Paul Verhoeven. Verhoeven doesn't interact too much with them, presumably to allow them to do their own thing without getting into technical aspects, but he is there. It's a casual track where they talk about their experiences on the film, without much about acting technique or anything like that. Interestingly, Casper Van Diem was once in the military, and offers a little insight into the underlying political messages of the film. This is an entertaining track, but not seriously into the intimate details of filmmaking. The third track is an isolated score in Dolby 5.0 discreet with commentary between musical pieces by the composer, Basil Poledouris. He discusses the underlying roots of his work on the film, mainly in wanting to create sweeping, militaristic songs that capture the essence of the war element. When isolated, his brilliant usage of quick jingles to accompany the FedNet "news" sequences (which are usually propaganda reels of some sort) become more apparent, and it's amazing how, even without dialogue or sound effects, his score totally gets everything across in these sequences. He also touches briefly upon the fact that he mixed the original soundtrack specifically for the 8 channel SDDS sound format (not available for home use), which probably explains why it sounds so good in the 5.1 format. The rest of the features are on a second disc, which starts off with a newly produced, 30-minute documentary entitled "Death From Above." The documentary is an excellent look at the development of the story from the novel and the dark satirical elements of creating a fantasy, fascist world. The filmmakers' intentions are very well stated and explained, and there are contributions from most of the central crew, as well as many of the actors. It's much better than the original featurette (which is also on this disc as the "vintage" featurette), which was primarily just a quick, promotional piece. A series of 5 featurettes entitled "Know Your Foe" offer a quick look at the ideas and effects behind the different bug types. They're each about 2 minutes long, and while it's annoying they've been split up, at least each one has a separate menu with a data sheet on a particular monster. In addition, there is a 4-minute featurette called The Starships of Starship Troopers discussing the ship and craft design, much of which was intended as homage to WWII-era technology. A series of special effects comparisons offers 10 scenes from the film without much of their final detail in filled in by either computer graphics or otherwise. In the bottom right-hand corner of the screen is the scene as it appears in its finished form. In a similar vein are storyboard comparison scenes (where you see the storyboard superimposed on the final scene) and scene deconstructions with commentary by Paul Verhoeven, presenting the shot from it's most basic form all the way up to the finished product with all effects, sound, and visual elements. There is also a gallery of conceptual art for a variety of the film's machines, creatures and costumes. Some of the work never made it into the film, but interestingly, would be seen later in the Roughnecks television series based on the film. Stuck in with some other stuff is the original test reel for the special effects, where the CG bugs in a desert war environment were tried out on film to see how it would look. This quick, 2-minute film, called Don't Look Now, features a short introduction by Paul Verhoeven. Elsewhere, there are original screen tests for Casper Van Diem and Denise Richards, as well as a set of deleted scenes. The deleted footage primarily focuses on expanding the relationship between Carmen Ibanez and Johnny Rico, and it's easy to see why it was removed, since it slows the film down, and adds nothing special. The disc is finished off with one original trailer, as well as some other trailers including the series preview for >Roughnecks: Starship Trooper Chronicles, the animated television show that dropped the political aspects of the story, but kept up the intense action and character relationships. For those who do move on to watching the series, be aware that it is not in strict continuity, and many of the characters who died in the film are magically back for more in the series. This new edition of Troopers is very satisfying and feels much more produced than the original disc. The packaging is nicely themed to the movie, and uses a variation of the original poster art, rather than the altered cover of the first DVD version. The menus are heavily animated and designed to imitate the FedNet screens from the film, including nicely done propaganda clips and a few moments, here and there, of new narration by the original narrator from the feature film. If the animated parts are annoying to you, they can be skipped by fast-forwarding. I guess it's up to the individual viewer to decide if this new edition is worth buying for those who already own the original, but if you're a big fan, I'd probably say yes. The one thing that especially impressed me was the informed materials and commentaries that did not shy away from discussing the political aspects of the story, while still maintaining a professional examination of the film on a technical level.